One of the most common questions and concerns I receive is about the RV electrical system. 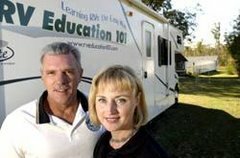 Most people ask if I can explain the RV electrical system in simple to understand terms. The electrical system in your RV can seem complex and confusing until you have a basic understanding of how it works. Your RV actually has three separate electrical systems. It has a 12-volt DC automotive system, a 12-volt DC coach system, and a 120 volt AC coach system. We are primarily concerned with the 12-volt DC and 120 volt AC coach systems. The majority of campgrounds you go to will provide you with an external 120 volt electric source to plug into. Your RV has a heavy-duty power cord that is normally about 25 feet long. Depending on the type of RV you have, or purchase, it will either be a 30 Amp or 50 Amp system. When you plug into the proper campground electrical source it will supply power throughout your RV. You must have a 120 Volt AC power source if you are going to use the microwave, roof air conditioner, the refrigerator in the electric mode and the 120 Volt electrical outlets. For the most part everything else in the camper works off of 12-volt DC power. When you are plugged in at the campground a portion of the 120 volt AC current is converted to 12-volt DC current for the items in the RV that work off of 12 volts. Some of these items are the overhead lights, the furnace fan, and the fan over the range, the vent fan in the bathroom, the water pump, LP gas leak detector, stereo, and the refrigerator when it’s in the LP gas mode. If you look at the RV’s power distribution panel you will see circuit breakers like you have in your house for the 120-volt AC side, and automotive style blade fuses for the 12-volt DC side. If you are not plugged into an external power source you can still use the 12-volt DC system if you have a 12-volt deep cycle marine battery on your unit. As long as the battery or batteries are charged you can use everything in the RV except the microwave, roof air conditioner, the refrigerator in the electric mode and the electrical outlets. If you have a motorhome, or you’re going to purchase a motorhome, it will have a battery for the automotive system and an auxiliary battery for the coach system. The coach battery is charged whenever the motorhome is running; the generator is running, or when it’s plugged into an external electrical source. Before we go any further I would like to offer a few basic battery maintenance tips to keep your RV batteries in top operating condition. First of all never work around batteries with an open flame. Vapors from the batteries can ignite, causing serious damage. To prevent the possibility of arcing turn off any 12 Volt power sources and disconnect the negative battery cable before working on or around the batteries. If you have a maintenance free battery you will not be able to perform some of these checks. The color of the eye on the battery will indicate the condition of a maintenance free battery. Consult your owner’s manual for more information on maintenance free batteries. Constant charging depletes electrolyte levels in batteries. Inspect electrolyte levels and add distilled water as required. Add water until it reaches the split-level marker in each cell. Do not overfill. Inspect all battery cable and terminal connections. Keep all connections clean and tight. Do not over tighten. When battery terminals are clean and tight on the battery post spray the terminals with a battery terminal protector to prevent corrosion. To clean the battery itself use a diluted baking soda and water solution. After cleaning the battery flush it thoroughly with water. Check the state of charge and keep batteries fully charged. Specific gravity readings for a charged battery should be between 1.215 & 1.250. If you remove the batteries for storage charge them to a full charge and check them periodically during storage. Re-charge as necessary. Follow proper charging instructions for the type of battery. Deep cycle batteries require a lower amp charge over a longer period of time. There are numerous electronic devices and equipment in your RV that can drain the coach battery when you’re not using the RV. Some examples are; the TV antenna booster, the LP gas leak detector, clocks in radios, or just leaving a 12-volt light on by accident. 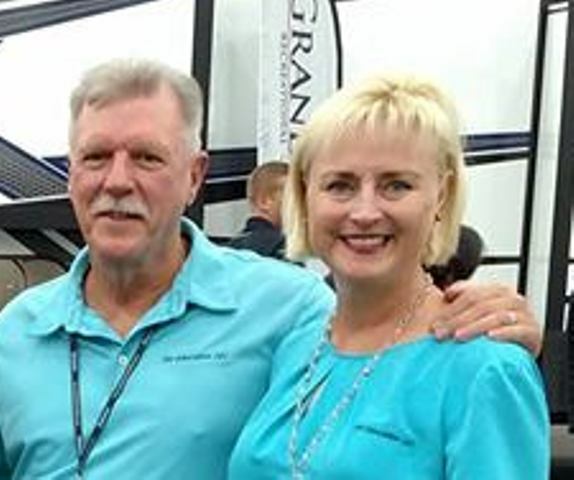 If your RV is not equipped with a battery disconnect switch you can purchase a battery disconnect, from an RV dealer, that can be installed directly on the battery post. When you aren’t using the RV or have no requirement for the coach battery you simply raise a lever and disconnect the battery. A battery disconnect can be installed on the chassis battery too. Lastly, if you are not comfortable performing the maintenance on your RV batteries have it done by a qualified service center. Motorhomes also provide an additional source of 120 volt AC power with an onboard power generator. This unique feature offers you the convenience of 120-volt AC power whenever you need it, making the unit fully self-contained. The fuel supply for the generator comes directly from the motor home fuel tank. The system is designed so that when the fuel tank gets to 1/4 tank full the generator will stop running so it doesn’t use all of the fuel in the motor home. Some motor homes have an automatic switch over from an external power supply to the generator. Other motor homes require you to plug the motor home power cord into a generator receptacle on the motor home to use the generator. I would also like to give you a few tips about RV electricity. To start with a 30 Amp system is the most common on RV’s. The plug on your RV is a large three-prong, heavy duty 30 Amp, 120-volt plug. Most campgrounds you go to will provide you with a 30 Amp outlet that your RV power cord will plug directly into. If you go to a campground that has a regular house type outlet there are adapters that you can use to go from your RV plug to the house type outlet. When you do this you are plugging into a 15 Amp or 20 Amp power source. This means you will be limited as to what appliances you can run in your RV. It is even possible to damage some appliances if they are not getting the required amperage to operate properly. Let’s say for example you plug into a 15 Amp outlet and you are using a small appliance that is drawing 5 Amps, that leaves you with 10 Amps. Now you turn the roof air conditioner on and when the air conditioner compressor engages it needs about 13 Amps, but it’s not available, and it damages the air conditioner compressor. Even with a 30 Amp service you need to be selective about what you are using. If you try to use too much the RV will let you know by tripping a breaker in the distribution box and hopefully no harm will be done. There is a short formula that may help you with this. 30 Amps X 120 Volts = 3600 watts. This is the total amount of power you can use before you overload the system. Think of it like this, with 3600 watts you could use 36 one hundred watt light bulbs. When you turn on the 37th light you will probably trip a breaker. It is also a good idea to take a voltmeter along with you that you can plug right into one of the outlets. Campground electricity varies depending on the demand placed on it. If everybody is running his or her air conditioner the voltage may drop below an acceptable level, and it would be wise to wait until it is restored back to normal. You can glance at the voltmeter every time you walk by it and save yourself untimely and costly repairs to your RV appliances. Voltage below 105 volts or above 135 volts can damage electronic equipment and appliances. Most appliances will tell you what the required wattage or amperage is to run the appliance. Here is the amperage draw for some common RV appliances and electronics. Hopefully this will provide you with a better basic understanding of how your RV electrical system works.